People talk about how Nepali are litterbugs and don't care about the environment. There are actually some good reasons for this to appear to be true. First, there are very few sanitary landfills in the entire country. Additionally even municipalities will use the river as dumpsites. 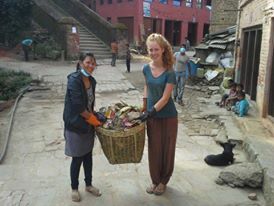 We, at Kay Garnay for Nepal, NGO, wanted to clean Changunarayan before the coming festival, Dashain. Our chairperson, Sajana, purchased gloves and other clean-up gear and about 50 people participated in the morning activities. This was our first of such community activities, so we learned a lot. 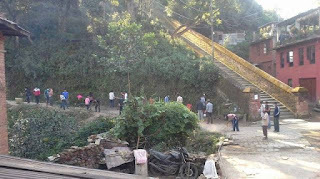 People in Changu gather to start picking up trash. Gloves, mouth masks and some homemade litter spears were provided. All in all about 50 people, young to old, were eager to start cleaning up their village. There was only one tourist among the volunteers. Sajana and I went together as we picked up litter. Rather than using plastic bags, we used bamboo baskets and wheelbarrows to collect the debris. Bio-degradable organic materials were supposed to be put in one pit and another one dug for the plastics. However, that didn’t happen as planned. Afterwards, according to our plan, a truck would come from Kathmandu to collect everything and take it to the recycling center - not to the river or burned. The locals weren't informed properly to make this first clean-up campaign successful. There was just no awareness that if, for example, you sprinkle insecticide along the road most of the insects will just move to a nearby garden or farm. 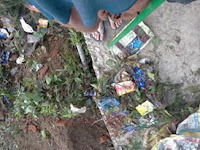 Yes, posters were made beforehand and distributed to places frequently visited by locals, but there was a lack of knowledge on how to start cleaning and how to get rid of the trash. We need to keep in mind as Westerners that it was we who introduced such poisons into this environment only 60 years ago. The problem is that you cannot blame the Nepali people. They do not get the required education to obtain the right knowledge on how to keep the Earth clean and safe to live on. In my head, several new ways of how to tackle this situation have arisen meanwhile. We could find some handy pocket-size reusable bags and distribute these among the locals so that they can do their grocery shopping etc. by using these bags. Also, we could make a presentation showing kids in school, ages 14-15, the 'Circle of Life' – and meanwhile hoping they will spread the message and be a living example of it. Furthermore, a great effort must be done to reach the outside world by spreading messages about the actual situation and hopefully we will attract more eco-minded people to volunteer and help not only this city, but the entire Nepal with their ideas. My eBook is available now at https://payhip.com/b/sQu5 If you are planning a trip to Nepal you'll enjoy it. It will save you time as well as money, but more importantly, it will help you to have a better time in Nepal. Many people wonder if they can eat the street food like in Thailand or Vietnam.